Indian meal moths and their caterpillars are a year-'round household pest. Common sources are bird seed, stored seeds and grains, dried fruit, nuts and dried plants and flowers. Control requires locating and eliminating the infested materials. Insecticide sprays are not recommended and washing shelves with detergent, bleach, ammonia or disinfectants will not have any effect on insect pests. See our Iowa Insect Information Note for more details. Another moth that we may encounter in our homes are clothes moths. Unlike the Indian meal moth clothes moth caterpillars like to feed on things of animal origin - such as wool clothing and rugs. But like Indian meal moth control requires locating what the caterpillars are feeding on and discarding it or treating it to kill the caterpillars. See this Yard & Garden column for more information. Black root rot of carrot. Black root rot caused by the fungus Thielaviopsis basicola was diagnosed on carrots sent from Wright County in late November. See photo below. The following is adapted from the University of Massachusetts Extension Vegetable Program website. 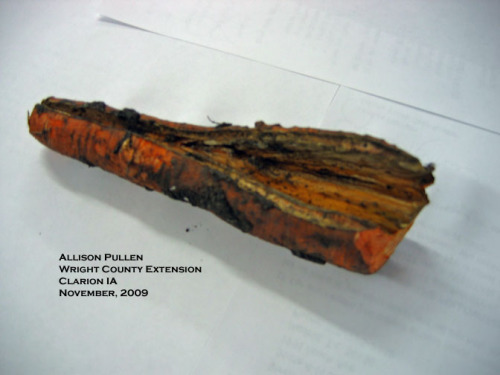 Black root rot of carrot is primarily a post harvest disease. The pathogen occurs worldwide and has a wide host range, including plants in the legume, potato, and cucurbit families, as well as numerous ornamentals and woody plants. The disease occasionally occurs on seedlings or mature carrots in the field and is more serious on soils with high organic matter content. Symptoms of T. basicola are superficial, irregular black lesions which occur in a random pattern. The discoloration is limited to the epidermis and the black coloration is caused by masses of dark brown to black fungal spores. The pathogen rapidly invades wounded tissue and is favored by long post harvest periods without cooling. Since this disease occurs primarily after harvest and mechanical grading, avoiding wounding and the prompt removal from field are necessary control measures. T. basicola is rarely a serious problem under optimum storage conditions (0-1 degrees C). Good disease control can be obtained when harvested carrots are dipped in chlorinated water. Black root rot of carrot. Photo by Allison Pullen. Links to this article are strongly encouraged, and this article may be republished without further permission if published as written and if credit is given to the author, Horticulture and Home Pest News, and Iowa State University Extension and Outreach. If this article is to be used in any other manner, permission from the author is required. This article was originally published on January 6, 2010. The information contained within may not be the most current and accurate depending on when it is accessed.